A brilliant lens for portraits, low light and midrange telephoto shooting. 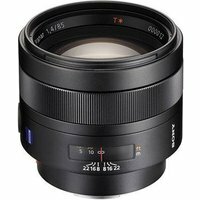 It's a beautiful piece of glass - for intimate or low-light portraits, fashion shots, and quick candid photographs with superior visual accuracy, this professional lens will satisfy the most uncompromising demands. Its performance at fully open aperture is astonishingly precise and gives you sharp midrange close-ups and natural, distortion-free portraits at relaxed distances. When used on an APS-C sized sensor the equivalent focal length would be 125.7mm.